There is one strong view in the job-business: more growth will lead to more jobs. We have to invest in only economic growth and not in employment creation programmes and other sectors. This is what the NDA-created Ahluwalia Task Force had maintained then. It would not be surprising if Ahluwalia, now in his UPA avatar, would continue to take this view. The task force had forcefully argued that a shift from 6.5 per cent to 8 per cent growth would generate an additional employment of 14.5 million by 2012. "In contrast," the report said, "the total volume of employment created by all special employment programmes put together is only 4.4 million and this level has actually declined over time." Interestingly, the Ahluwalia committee also trashed the UPA government's plan for additional employment generation arguing that, "because of severe resource constraints, it is unlikely that the volume of employment provided by special employment programme can be increased significantly in future." This report therefore, emphasised on the macro-level policies needed for rapid growth. It pushed for higher rates of investment, improvements in efficiencies, improvement in infrastructure, reforms in the financial system and credit for the informal sector. But the stress was broadly on doing more of what is being done currently to accelerate economic growth. Jobs, they all argue, will come as a bonus. Similarly, in the field of agriculture, the attempt should be to increase its efficiencies by bringing in private capital and public-private partnerships. For instance, the Ahluwalia task force recommends that leasing of land should be liberalised (read made easy for private interests to garner land); degraded wastelands can be taken out of the purview of tenancy laws and agro-companies allowed to buy, develop, cultivate and sell this land. Therefore, in its view the growth model for agriculture is the same as the industrial sector -- regardless of its failure to provide jobs. For the small scale sector, the task force mouths some platitudes, but then recommends that the policy of reservation cannot be sustained in the face of the new import regime and de-reservation (which provides the protection to this labour intensive segment) must be completed over the next four years. Therefore, the organised -- labour-poor, but much more efficient sector -- would ease out the less competitive unorganised sector. But where the Ahluwalia task force sees major growth is in the service sector -- from travel to information technology to road transport and trade. The real issue is if this strategy is adequate? The current experience does not tell us that it will not work. The proposals may be essential for economic growth, but they will not break the growth-without-jobs syndrome of the modern economy. But then, what will work? India needs a new approach to increase its employment potential -- moving consciously to source jobs from the non-organised sectors, particularly from rural-based non-farm sectors. The issue to look at carefully is whether there has been a decline in the key livelihood areas of agriculture, forestry, livestock, fishing, and horticulture and to see how these can be renewed and revived. In other words, the environment is the business of creating jobs. The question is why has this sector failed till now. Interestingly, this was also the focus of the S P Gupta special group set up by the NDA government. According to this Planning Commission committee, a growth rate of 8 per cent would be inadequate to meet the employment challenges. It therefore, found the alternative strategy was to identify activities with a major potential of large new job opportunities -- agriculture, social forestry, fishing, animal care, horticulture as well as the small and medium industries and the service and financial sectors. 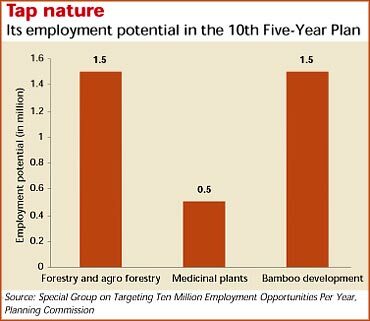 For instance, according to the special group report, the total additional job opportunities that could be created in the agricultural sectors would be 9.47 million in the 10th Five Year Plan (see graph: Tap nature). These jobs would come from variety of initiatives like watershed programmes, medicinal plants, bamboo development and plantations of energy rich species. But it needs to be understood that there are serious obstacles to these opportunities today. It is only when we understand why these livelihood options are not part of the economic future that we will understand what can be done to make this work. It is clear that green livelihoods will need more than platitudes and government reports. They will need an enabling macro-economic framework to maximise their potential.